When Eric Mumo graduated from university with a First Class honours degree in 2009, he got several exciting job offers, but he declined them all. Fresh from Jomo Kenyatta University of Science and Technology, the statistics graduate opted for commercial farming and set up his base in the most unlikely of places — his arid village of Nzangathi in Kitui County. 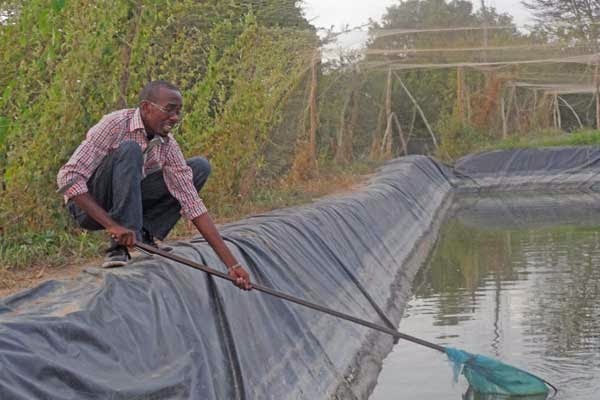 He started with Sh150,000 of personal savings that has now grown into a thriving farm worth Sh16 million in assets and 12 full time employees. In just five years, Mr Mumo has built up a steady enterprise which includes dairy, fish, poultry and horticultural units on his 15-acre land and won several innovation awards. At first, his peers and some family members feared that he was gambling with his future instead of seeking formal employment. They felt, and genuinely so, that his good academic papers and young age should not be channelled into risky and unpredictable ventures like farming but rather into the flashy corporate world. However, determined to pursue his ambition, and armed with passion for his dreams and a little capital, Mumo bought a Friesian dairy cow. “I bought the first dairy cow in 2009, and soon after I added two more. I started supplying fresh milk to local restaurants” he says. Each cow was producing on average 14 litres daily, which he sold at Sh60 per litre at the nearby shops, earning Sh2,520 daily. The 29-year-old went full blast when he sunk a borehole, which enabled him to put his father’s entire 15-acre farm on drip irrigation. “In the first season, I harvested hundreds of tonnes of water melon, which I sold in Nairobi, recovering the costs of my investment and bought an Isuzu pick-up truck,” he recalls. With a kilo of water melon then going for Sh32, each trip to Nairobi was fetching on average Sh48,000, and he could make several in one week. When the Saturday Nation sought Mumo for this interview, we found a delegation of 80 farmers from the Embu Anglican Church Diocese learning from his simple, but effective farming techniques. The farmer has been recognised by the United Nations Food and Agriculture Organization (FAO), the World Food Programme (WFP) and the Ministry of Agriculture for his outstanding innovations in food security. Last year, he was listed among the most innovative and promising young farmers in the country, besides being pre-qualified as a dependable supplier of fish fingerlings in the region. Mumo stands out because of his ability to integrate all the farming units, where they inter-depend on each other to reduce production costs. The farmer says Ukambani region can easily sustain itself if only enough water was made available to every home. Every week, he is kept on his toes by overwhelming orders to supply all sorts of produce including day-old chicks, tomatoes, fish, milk to the market. In a good month, proceeds from milk, poultry, fish, fruits and vegetables can fetch him Sh500,000 gross. He makes more when he sells in bulk. Mumo urges the youth to dirty their hands to make money. His farm has created 12 direct jobs, and many others indirectly. Mumo intends to turn his farm into a demonstration centre where farmers across the region can visit and learn from the simple ideas and replicate them in their homes. Since Eric Mumo ventured into commercial farming, he has learned on the job the hard way and overcame odds. From seeking credit to finance his projects, to marketing his farm produce and managing workers, he faced challenges he never expected. Getting a bank loan to invest in farming was his worst nightmare because the interest rates are high and there is no grace period. “Banks are asking us to start repaying their loans in the first month, and yet there is no crop that can yield results in such short time.” This frustrates many farmers. Mumo urges the government to establish a branch of the Agricultural Finance Corporation (AFC) in every county to support farmers. The other challenge has been lack of skilled labour, which has forced him to invest heavily in training his workers. “Most people who seek jobs in farms are semi-illiterate. Such workers cannot manage a poultry house, or monitor the health of fish or dairy cows,” he explains, adding he incurred huge losses until he started training his workers. The farmer explains that agriculture extension services are not sufficient. “Kenya can sustain a double digit economic growth if agriculture is made a compulsory subject up to Form Four to make the youth stop their obsession with white collar jobs.” Mumo has also learnt to invest in marketing and quality of his produce. “I’m very keen on the quality of my products because I target mostly Nairobi and export market where consumers demand the best,” he says.